The oval-shaped smooth gears in the FTB3000 Series are used to displace a precise volume of fluid,which is passed through th emeasurement chamber during each revolution. The toothless design,working with the fluid being measured, provides a complete viscous seal within the measuring chamber. This sealing effect provides for greater flow measurement accuracy. The displacement of the fluid is translated via a magnetic or Hall-effect pick-up into a pulse output that is proportional to the flow. The unique design of the FTB3000 oval gear meter incorporates two smooth(toothless) oval gears positioned 90 degrees out of phase. The measurement gears are held together by two timing gears. 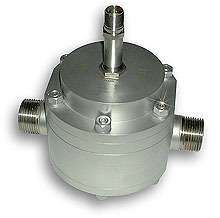 The standard meter contains no seal between the measurement chamber and the timing chamber. The timing gears have a pitch diameter equal to the outside diameter of the measurement gears. The flow through the meter measurement chamber follows the path of least resistance. Therefore, no liquid passes through the center cavity between the measurement gears. The fluid is displaced from the inlet to the outlet via the area between the smooth oval gear and the inner diameter of the meter housing. Conventional oval gears have teeth that mesh. One of the advantages of smooth oval gears is that the viscous flow does not get trapped or squeezed between the gears. Typically, oval gears need to have cuts made in the teeth to allow high viscosity fluids to pass. These cuts result in a decrease in accuracy. 참고: Add suffix “-150LBF” (150 lb stainless steel flange) or “-300LBF” (300 lb stainless steel flange) to the part number and $250 to the price. Comes complete with operator’s manual, mating connector, and 10-point NIST calibration.